Sutton Hoo is one of the National Trust‘s premier sites in East Anglia, and is of great importance in telling the early story of England. We visited on an early spring day, as part of a planning trip for a coach tour that I’ll be leading in the summer of 2017. It was an excellent excuse to revisit the site, we’ve been many times over the years and always enjoy our trips. In 1939, the landowner, Mrs. Edith Pretty, asked local farm worker and archaeologist Basil Brown to investigate one of the 17 burial mounds on farmland near to her home. His investigations led to the discovery of the famous ‘ghost ship’ within what is now known as Mound 1. It is thought to have been the burial ship of the Anglo Saxon Warrior King Raedwald. Of the ship all that was found was the ghostly shadow outline, but within it was found a treasure that Basil Brown later described as “the find of a lifetime.” The find was made up of beautifully worked jewelry and weaponry, plus all that a King would need for the after life. The most famous object to be found were parts of an intricately worked silver helmet. The treasure is now on display in the British Museum, (although after it was first found it was kept under Mrs. Pretty’s bed.) There is a very detailed and informative exhibition about the site, alongside some beautifully crafted replicas of the original Sutton Hoo treasure. The replicas give visitors a great chance to admire the wonderful craft work and level of skill shown by the original craftsmen in the 7th century. It’s thought that the items were traded through the port of Ipswich, which sits 20 miles inland on the River Orwell. 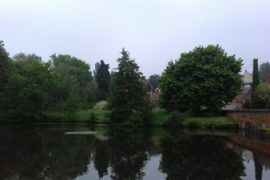 As well as the exhibition there are some good walks around the mounds. There isn’t a lot to be seen now, but if you read the display boards around the mounds you will begin to understand the many layers of history and man’s influence on the area. The mounds are crossed by Medieval tracks, the land has been heavily farmed over the centuries, and there is also evidence of Second World War defences. There are views across the Suffolk countryside to the River Deben, along which the great ship carrying Raedwalds body would have travelled. 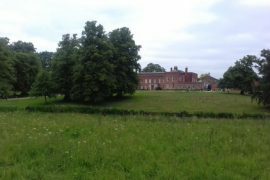 After immersing ourselves in Anglo Saxon history, we walked across the field to Tranmer House and 20th century history. This was Mrs. Pretty’s home for many years, and from here the dig for the ship was organised. In recent years it has been refurbished by National Trust volunteers very much as Mrs Pretty would have known it. There are sofas to sit on, a piano waiting to be played, and in the drawing room Mrs. Pretty’s wartime knitting waits to be finished. During the Second World War, girls from the Land Army were billeted in the house. It’s an isolated spot and many of the girls came from the inner cities. To pass the time and relieve their boredom on long winter evenings, they carved their names in the stone mantelpiece in one of the rooms. The volunteers are very happy to point out the carvings, and tell you stories about the girls who worked on the land. As you leave the house you can have a quick peep inside Basil Browns workshop, where time has stood still at 12 noon on the 3rd September 1939. After all that walking and exploring we visited the secondhand bookshop, I work on the theory that you should always check a secondhand bookshop in case the perfect book is hiding inside waiting to be bought. We then had a slice of homemade National Trust cake and a pot of tea, ready for the drive home in the early spring sunshine. We were very good and didn’t buy anything in the shop, as disappointingly there wasn’t a replica of the inconic helmet on sale as there had been on a previous visit. Maybe next time!